What does the price of apples have to do with the large number of jays and squirrels around the garden bird tables this autumn? Well, the simple answer is shortage. As most of you know the prices of fruit and vegetables in greengrocers and supermarkets have already increased dramatically since last year as a result of the appalling weather in late spring and summer. So it is with our wildlife. Trees such as the oak, just like apple, were seriously affected by the prolonged, cool, wet weather which prevented bees and other insects from pollinating the flowers, with the result that acorns are few and far between this autumn. So, in the absence of acorns, which jays and squirrels rely on both to fatten them up before the onset of winter and as stores, they are visiting the garden bird feeders in greater numbers than in earlier years taking peanuts, sunflower seeds and even the squirrels have been feeding on fat-balls, something I've not seen before. Jays have been storing nuts in crevasses in tree trunks and squirrels have, as usual, been digging holes in the turf or, as often happens, in flower pots and then carefully sealing the holes. Clearly, after thousands of years of development this random storage system must pay off, however, their memories are clearly far from perfect as demonstrated by the number of sprouting acorns appearing in flower pots in the spring. As reported last month, mid September saw the emergence of a large number of red admirals (Vanessa atalanta) that were all the more noticeable after a summer in which, apart from large/cabbage whites, butterflies were in short supply. These beautiful butterflies are primarily migrants from Europe and North Africa although a very small percentage are able to survive the winters in milder parts of the south of England. They usually arrive in May - June and after egg laying and pupation, mostly occurring on nettles, the adults emerge in all their glory from mid August through to early October. This year their arrival seems to have been delayed because only isolated sightings of this butterfly were made in the July and August. 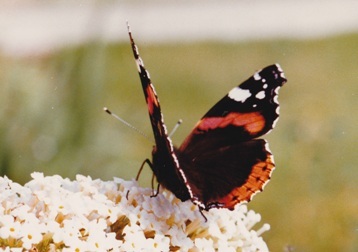 However, better late than never and, providing the weather remains mild, red admirals will hopefully continue to fly well into October or even November feeding on rotting and fallen fruit. Recently whilst clearing a small barn with the National Trust volunteers we had two pleasant surprises. The first occurred when a barn owl, temporarily disturbed by our presence, flew silently from its roost on a high rafter, over our heads and into the trees. The second came when we discovered a very plump, adult hedgehog in the hay and straw litter on the floor of the barn - it was most probably investigating a potential site for winter hibernation. More sightings of buzzards seem to suggest their numbers are increasing. Just a few days ago four of these large raptors could be seen circling the fields east of Dayseys Hill. Suddenly one of the birds started a spectacular display - the males do this either to attract a mate or impress their existing one. These displays are known as "roller coasting" where the bird flies to a height and then proceeds to plummet down in a twisting spiral flight and then when near its mate it turns and then flies upwards to repeat the performance as many as three or four times.